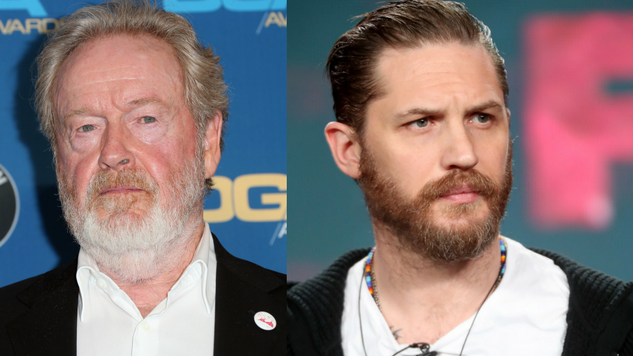 Netflix, spreading their creeping reach ever further, has landed a deal with Tom Hardy and Ridley Scott, Hollywood’s hardest working man, for a Navy SEAL adventure titled War Party. This is yet another team-up for Hardy and Scott, fresh off their first season of FX’s Taboo. Scott will produce War Party through his Scott Free Films, while Hardy is attached to star. There are no plot details yet, as they’re being kept under wraps, but it’s supposedly based on true events involving real-life Navy SEALS. Hardy and Scott will in turn team up with Andrew Dominik, director of the stylish western The Assassination of Jesse James by the Coward Robert Ford. Dominik will write War Party with Harrison Query, in addition to directing. This seven-figure deal is the newest in a long line of power moves made by the streaming giant. Netflix outbid Amazon, Universal and Lionsgate for the film, per THR. War Party has no set release date, while Taboo season two comes back to FX next year.